On Tuesday September 9th we brought the keys and coupler chassis to New College Oxford, for fitting into the space. The original couplers used backfalls with steel pivot pins which had worn holes in the capsels and become stiff. 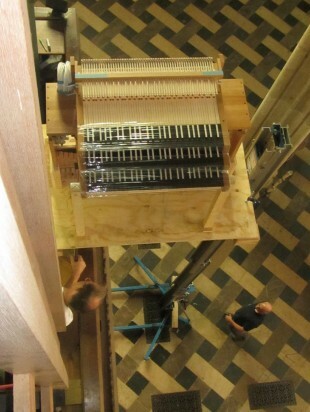 Due to pressure of time (the organ has to be ready for the first service of the new term on October 10th) we have asked Baumgartner Orgelbau to make new keys and couplers – an excellent job carried out at fairly short notice. A relief to get it all onto the gallery and into position.